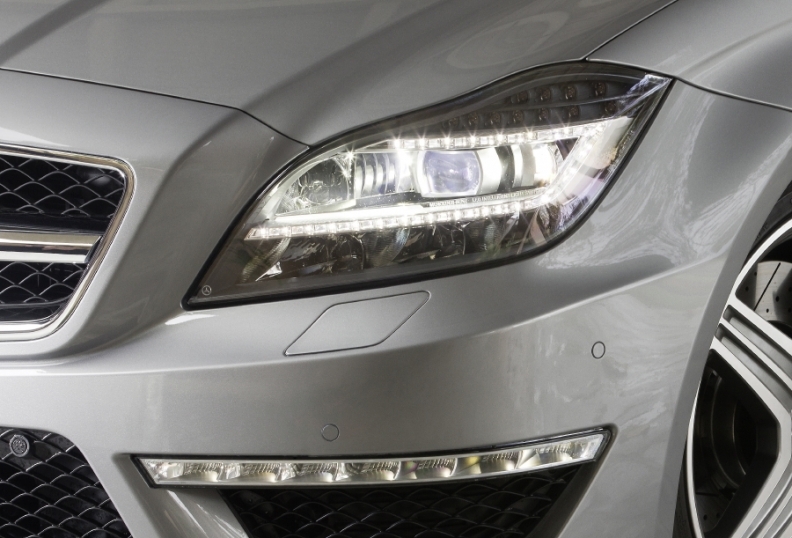 Automotive Lighting's full LED headlamps are on the Mercedes CLS. Editor's note: A previous version of this story misstated the name of Valeo's lighting partner, which is Ichikoh. LED headlamps will start to gain ground over rival technologies by the end of the decade, said an executive at one of the early leaders in the technology. "By 2020, LEDs will really be penetrating into the market, taking share from both halogen and xenon," Kamislav Fadel, head of r&d at Automotive Lighting, told Automotive News Europe. Automotive Lighting, which it part of Fiat-owned partsmaker Magneti Marelli, supplies LED headlamps to the Audi R8 and Mercedes-Benz CLS. The company's main rivals are Germany's Hella and ZKW as well as Japan's Koito. Oliver Wyman analyst Lars Stolz does not expect the shift to LED headlamps to happen fast in the total market, but he does see LEDs gaining ground quickly in high-end models. "In the premium segment, we will see fast penetration with LEDs being available in almost every newly launched model by 2016," he said. In Europe, Stolz sees LED penetration growing to 3 percent to 4 percent of the total market by 2015 to 2016 with 80 percent to 90 percent of those headlamps being installed in premium models. Xenon is forecast to account for less than 30 percent and halogen for the rest. (See chart, bottom). "LEDs will grow fastest in Europe followed by Japan and then North America," Stolz said. Only 1 percent of North American-built vehicles will have LED headlights by 2016, while 12 percent will have xenon headlights, according to L.E.K. Consulting of London. A source at another lighting supplier told Automotive News Europe that LEDs will appear on a compact segment vehicle in Europe this year. Fadel said that even if this happens, the biggest challenge for LEDs is that it will take years until they will be able to match the performance of xenon at really affordable prices. "Entry-level LEDs will match or beat the xenon performance at a lower cost than xenon, but it be closer to 2018 or 2019," he said. "That does not mean that you will not see LEDs in mass production cars, but the question will be: What is the take rate?" Fadel added that xenon lighting is still gaining share because the technology continues to be improved. "There is a new, simpler xenon technology coming to market by the end of the year," he said. "It is a 25-watt system instead of 35 watt and it has no leveling and no automatic washing required." It will take longer for LED headlights to catch on mainly because of their high cost. Industry estimates show that a simple halogen headlight costs automakers about $20, while a standard xenon headlight might cost $60 to $80. By contrast, LED headlights might cost three times as much as xenon headlights. That cost, however, is coming down about 5 percent to 6 percent a year, Oliver Wyman's Stolz said. Despite the high cost, suppliers are marketing LED headlights as suitable for mass-market segments. The goal, said Visteon lighting director Rainer Neumann, is to make LED headlights cheap enough that automakers can offer them as standard equipment. Unlike their European peers, Americans are unwilling to pay extra for upscale headlights, Neumann said. "At the moment, LEDs are most attractive in Europe," Neumann said. "The technology has to be competitive in pricing to xenon. In the U.S., it's still a little early." Fadel thinks it will take time before LEDs will be a viable technology for volume cars. "Penetrating the mass market will be quite difficult," he said. "Even by 2018 or 2019, I don't see LEDs taking a significance overall share of the market." Each of the three main headlamp types generates light differently. A traditional halogen bulb generates light when a tungsten filament is heated. It is relatively inefficient, converting only 5 percent of the energy used into light. By contrast, a xenon bulb generates light when electricity is arced between two electrodes through xenon gas inside the bulb. The electrically energized gas emits light. Xenon bulbs, also known as high-intensity discharge lights, use less energy than halogen bulbs, yet they produce three times as much light. Xenon bulbs last about 2,000 hours or so - about twice the life span of a halogen bulb. BMW introduced xenon headlamps in 1991 on the 7-series sedan, and the technology enjoys especially strong demand in Japan. According to L.E.K., 38 percent of vehicles built in Japan have xenon headlights, compared with 20 percent in Europe and 10 percent in North America. Xenon headlights have not caught on as quickly in the United States because they emit a bluish light that U.S. motorists sometimes find unnatural, Neumann said. "Xenon headlights were never very well accepted in the U.S.," Neumann said. "With LEDs you are much closer to sunlight." LEDs generate light when electricity is passed through a diode that is made from a silicon chip. Because they do not generate light from heat, LEDs are much more energy-efficient than halogen bulbs. For example, a Visteon-designed LED headlight for Bentley requires only 15 watts for the low beam, rather than 65 watts for a halogen bulb. Added Fadel: "The advantage of the LEDs in the future, meaning the next three to four years, is that potential to reduce the consumption is much greater than for the xenon. The limit for xenon is 25 watts. While we are working on an LED that by 2015 to 2016 will have a one-digit watt consumption for the low beam." LEDs also are more durable than the rivals, lasting 10,000 hours or so, about 10 times longer than a halogen bulb. Automakers first used LEDs for center high-mounted stoplights, next for taillights and most recently for headlights. A Koito-designed LED headlight debuted in 2007 on the Lexus LS 600h, while Automotive Lighting produced LED headlights in 2008 for the R8 supercar. In the United States, Cadillac introduced Hella-designed LED headlights on the Escalade SUV. Other luxury brands are adopting LEDs too, because they are small and can be bundled into a variety of striking packages. The Audi R8's daytime running lights, for example, consist of 24 LEDs. Designers love LEDs because the square cells used to generate an LED's light are just 1mm wide. The compact dimensions give designers freedom to convert plain headlights and taillights into fashion statements.